Today we are going to discuss one of the most important, possibly of the most misunderstood issue of faith and its significance in context of modern science. Please note that this is purely an editorial write up and not biased towards or against any specific faith. Infact the word faith is not used in that sense but a different one. Faith is meant in different ways like the belief system or any religious set of teachings in the broader sense, but in this discussion our meaning of the term is slightly different. We use the term in context of believing something which we have not experienced or seen directly or indirectly and something which does not exist as a documented science in the way we have say physics, mathematics or similar sciences. The answer to this question is both yes and no at the same time. If we talk about religion which is a surface level extraction of spirituality (you can check out our article on being religious but not spiritual) then certainly faith is necessary for there are many things which cannot be answered and have to be taken for granted. 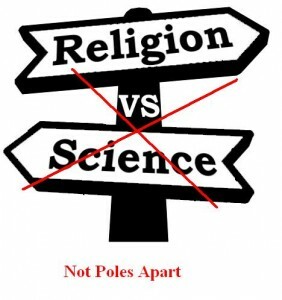 However as we shall later in this post, faith and spirituality are not “poles apart” as many people usually think. Infact a deeper analysis just shows that it is quite normal to club faith and science if done in the right manner. However in case of spirituality, you don’t have to believe anything. So here is where the complication starts. Firstly you need to have belief in everything in life. Even in small things or acts unless you have faith that you will succeed you will not achieve anything. You wont eat the chemicals given to you by a medico (called medicines) unless you have a faith that they will heal you even if you don’t understand how exactly they work or react on your body. There are hundreds of examples from everyday life where faith has to be there, irrespective of whether you realize it or not. So if faith is necessary for such simple things, do you really think you can get away without faith in one of the most important quest of life. Here is where the “ponga-pandits” come into the picture, though let me clarify that the term pandit is not used in relation to any specific religion but means the representatives of any religion and the term “ponga” means semi-genuine or dubious. They say that you need to have faith and should follow them in order to achieve results, but then in the name of that faith they start to misguide you for their own personal ends, be it extracting money from you or other motives. Having identified the problem, the next step is to know then what should be done by an ordinary person who does not have much knowledge or experience in this field. The only answer here is just search and seek but do it with some common sense attached to it. It is not good to blindly believe anything on the spiritual path but it is also not good to be a total doubting Thomas at the very outset. Firstly each one of us is at a different level of development so we may not have the inherent capability of separating the wheat from the chaff in terms of genuine teachers and “dhongi sadhus” . It might seem something silly on the spiritual front but you can always do trial and error method. So even if you are in total dark about where to go next, take one step at a time, be careful and then take the next. Choose any particular teachings and try to follow them diligently, of course choose wisely in the sense that they are convenient as per your desh and kaal meaning that they are in tune with your current circumstances and way of life. So if you are a busy city inhabitant, you better not choose a path which asks you to leave everything and live in isolated hills. Then give time to follow and actually practice those teachings, and then you will feel over time if you are on the right path. The other school of thought says that once you choose or dedicate yourself to any path, you should not give up unless you succeed. This is certainly a good idea too and is more useful for people who have a very strong will and can withstand all obstacles, difficulties and continue towards their goal. However make sure not to end up being dogmatic rather than being spiritual. Satsang basically refers to sat + sang which means the company of good. This is a very basic principle that the type of company you keep effects your thoughts and subsequently your actions and way of life. So the ancient rishi munis developed this concept of satsang where people gather to discuss spiritual things or to hear a discourse from a teacher. Again this needs to be done in the right spirit otherwise such a gathering would just become a platform for a social grouping or event rather than a true satsang. Where there is a will, there is a way. Even if you hardly know a thing about spirituality but are determined to find out, you will certainly progress over time. Action or karma never goes in vain says a particular religion and other says “seek and you shall find”. The ancient seers who wrote about meditation followed the method of observation, research and conclusions as is the scientific way. Infact even the physical sciences were quite advanced in the previous times and there are examples all across the world be it the standing stones or megaliths, the ancient pyramids or incredible feats performed by Saints and Sages. This knowledge was passed on from Guru to Shishya and also involved the vocational study system where one would learn the skills to survive at that time. More stress was laid on developing internal life which was the only way to a more meaningful and peaceful existence. The only thing we need to do is just to have slight faith and then work based on that and see the wonders for ourselves. It is certainly a very topic and cannot be covered in a single post, but to summarize, you should certainly try to seek the real truth, keep the quest on and do not give up anytime. It is more important to keep moving rather than giving up even if the progress is slow. Infact even if you sometimes happen to trample on the wrong path, you will realize it and turn back with some new learning. It is important to have a right mix of study, practice, actions and lifestyle to move forward on this path. So best of luck on this journey.